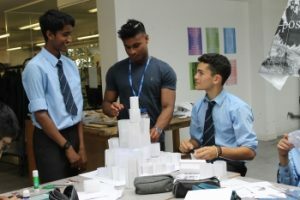 Equipped only with card and drinking straws, Year 10 boys had to be constructively creative during an architecture event held as part of QE’s Enrichment Week. 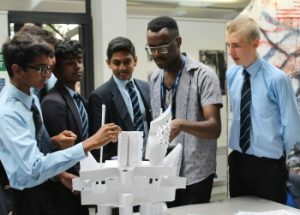 For the challenge run by the Art department, House teams were asked to make an architectural structure made up of modular forms, with a theme of Folded Architecture. Two of 2017’s Year 13 leavers, Nabil Haque and Tochi Onuora, who are both studying Architecture at Cambridge, came back to help. With function therefore following form, the six-strong teams decided that what they had designed could be put to use for buildings as diverse as stadia, hospitals, safari lodges and residential accommodation, to name but a few. The pieces were judged at the end of the event. 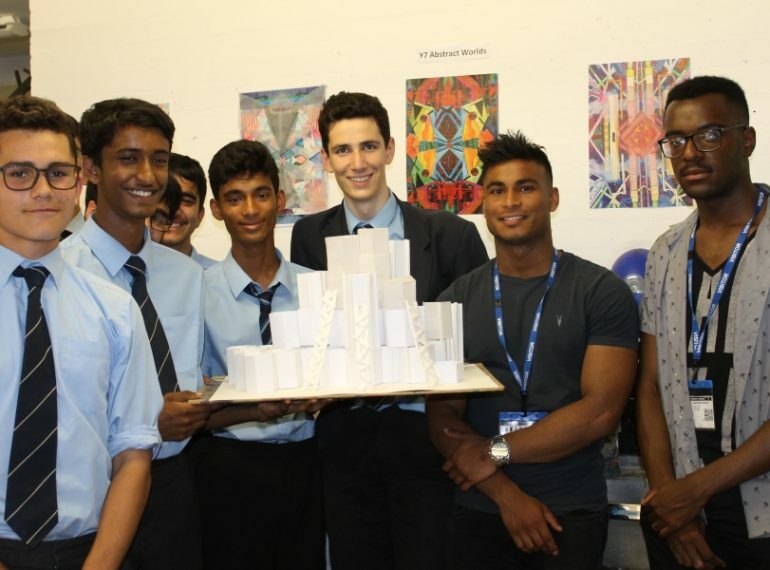 The Stapylton House team – comprising Alex Aliev, Nikhil Gulshan, Rakul Maheswaran, Jack Runchman, Aqif Choudhury, Riaz Kalim and Jude Miranda – won overall. Their contribution was praised for the way that it essentially used the same hexagonal shape repeatedly to build up the structure and create something very stable, yet still architecturally interesting. Head of Art Stephen Buckeridge reported that the two visiting Old Elizabethans were very complimentary about the boys’ innovation, lateral thinking and openness to exploring new ways of thinking. He added that the models looked very professional, considering the time spent and rudimentary nature of the materials used. In fact, so good were the models that a small exhibition was staged to give other staff a chance to see them. Stapylton House are the winners of the 2017/18 House Cup – reclaiming the coveted trophy from last year’s champions, Underne. Stapylton’s victory means this House has now won the trophy – formally the Eric Shearly Memorial Cup – for three of the last four years. 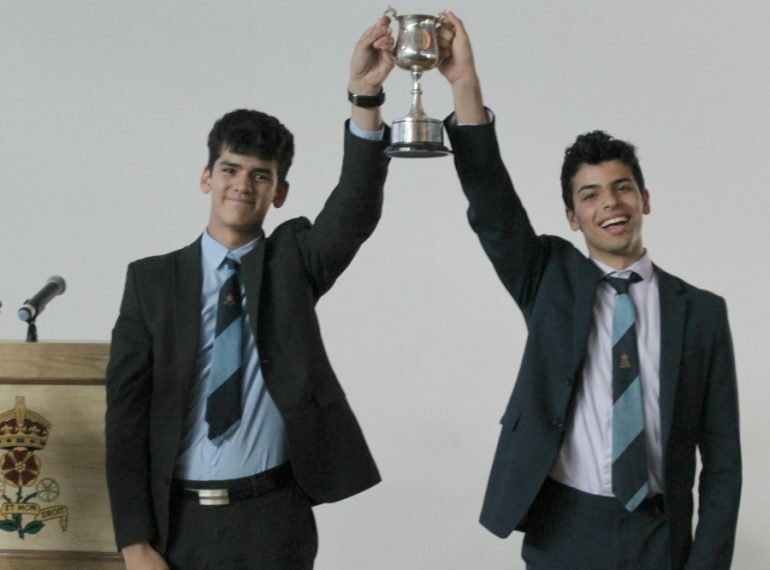 The triumph was announced at the end-of-year House assembly, where the cup was presented to House Captain Oliver Than-Lu and his Deputy, Omar Taymani, both from Year 12 (pictured above). The assembly celebrated outstanding performances over a wide range of fields, including the performing arts, sport and charity work. For this year’s House Drama competition, participants were challenged to produce original plays on the theme of a dystopian future: Leicester won the competition for the third consecutive year. The House Music competition was won by Pearce. In chess, the winners of various competitions were honoured, as were the boys chosen to receive junior, intermediate and senior colours. Similarly, the assembly highlighted the names of boys who had won colours for music and sports. There was a review of performances in sport throughout the year, including cricket, rugby, water polo, swimming and athletics. One innovation was the announcement of ‘teams of the year’ for cricket and rugby, which included leading performers from all year groups. House charity fund-raising events during the year were celebrated, together with the work done to support the Sri Sathya Sai English Medium School in Kerala, India, with which QE has enjoyed a longstanding partnership. Participation in The Duke of Edinburgh Award at QE remains strong: 100 boys from Year 10 enrolled for the bronze award in October and are due to complete their Qualifying Expedition in August, it was announced, while 34 Year 11 pupils signed up for the silver award and 18 Year 12 boys for the gold. 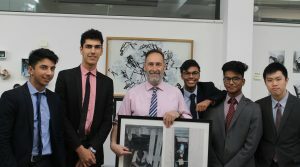 A number of House competitions run by the academic departments: these included, for example, a Languages competition to design a poster about a famous and influential linguist, which was won by Year 8 Stapylton pupil Jashwanth Parimi, and a photography competition for Years 7–9 run by the Geography department. 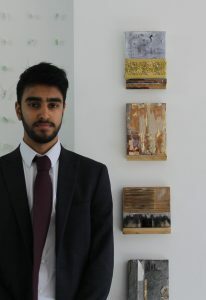 Sixth-former Darsh Thacker’s ambitious artwork has been chosen for the Royal Academy A-level Summer Exhibition Online 2018. He beat off competition from some 2,000 entries to be included among the exhibitors. 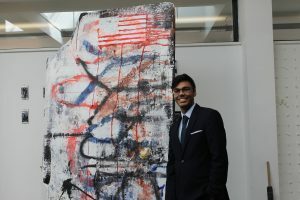 Darsh’s project, measuring 2.56 x 2m, was displayed recently at the School along with work by his fellow QE Year 13 Fine Art A-level students. For these final pieces of work, many of the boys drew inspiration from research into their own planned career paths. 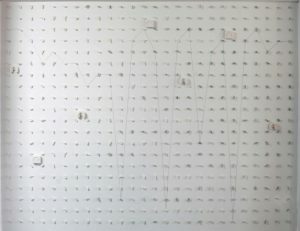 Darsh is going on to study Dentistry and his project explores the division between the personal and the clinical spheres. He employed a range of contrasting materials, including plaster of Paris casts, string, nails and even chewing gum. The boys were required to show evidence of deeper thinking, and “encouraged to be ambitious with their final outcomes, which are supported by a written final statement which articulates ideas and makes connections, both historically and contextually,” Mr Buckeridge added. An expert panel of judges selected Darsh’s work as one of only 43 winning entries from more than 2,000 submissions by over 1,400 young artists. • Anand Joshi, whose artwork on the Human Condition depicted a cell. He read and researched existentialism and the writings of Michel Foucault. The French philosopher and social theorist wrote extensively on the topics of power and knowledge. • Milan Shah, who is going on to read Politics and whose work explored ideas relating to politics and news. He used collage and mixed-media to look at how we respond to information in the modern technological world. 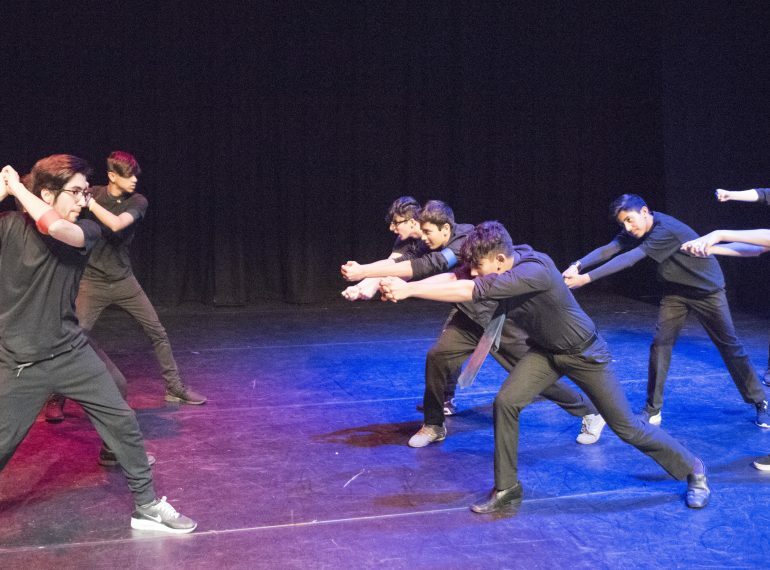 QE’s own ‘band of brothers’ – the School’s tightly knit group of senior actors – gave a powerful performance of Henry V at the 2017 Shakespeare Schools Festival. A 23-strong cast, headed by Year 13’s Nicholas Pirabaharan in the title rôle, brought their abridged version of the history play to the ArtsDepot in North Finchley for the world’s largest youth drama festival. Elaine White, who runs QE’s drama provision, said the ensemble had, as ever, coalesced well, with the older actors supporting the new Year 10 boys effectively as they all got to grips with Shakespeare’s account of events during the Hundred Years’ War before and after the 1415 Battle of Agincourt. “It can be difficult delivering Shakespearean language for the first time, but our boys learn quickly and always end that journey with a thorough understanding of their part,” said Mrs White. “Their storytelling became stronger and, by the big day the final piece was well-defined, with some solid performances. Keenan Dieobi played the French king, while his fellow Year 13 pupils, Al-Fayad Qayyum and Mohit Miyanger, took the rôles of the Duke of Exeter and Fluellen respectively. Among the backstage support were 2016 leavers Miles Huglin, Shiras Patel and Alex Wingrave. The audience included the Headmaster, Neil Enright, and a number of other staff. Earlier this term, festival experts led a workshop for QE’s cast and crew to help them with their preparation. 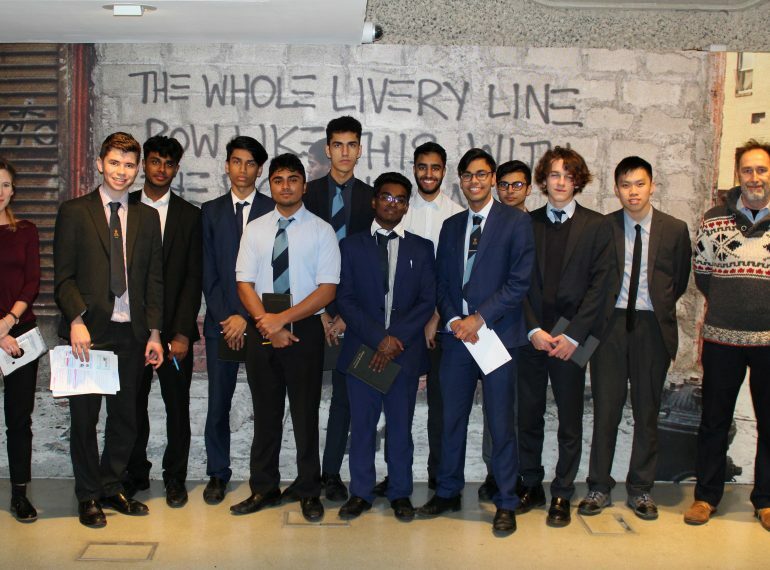 QE’s final-year A-level Art students took a trip to the Barbican to see the UK’s first large exhibition of the work of Jean-Michel Basquiat. A pioneering prodigy of the 1980s downtown New York art scene, Basquiat worked with leading figures from the city, including Andy Warhol, the rock band Blondie and fellow artist Keith Haring. Entitled Boom for Real, the Barbican show is an aggregation of pivotal pieces that chronicle the creative exploits of the young artist as he transitioned from teenage provocateur to international forerunner. 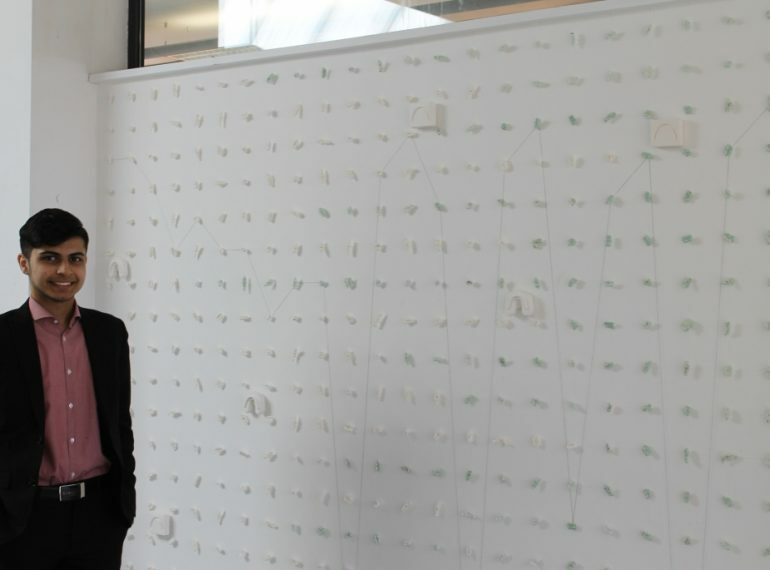 Art teacher Jillian McAteer said: “We were led through the exhibition by an informative tour guide who elaborated upon the wider connections of the work. We were shown how poetic graffiti, candid self-portraits, collaged postcards and playful bebop alluded to experiences of racism, consumerism, art history and fantasy. “Basquiat’s practice is relevant to the current A-level class in a number of ways. Some students are interested in his use of media, colour or text, while others are concerned with the aesthetic, social or personal questions he raised. “The class are currently coming to the end of a significant body of research and the outcomes are both diverse and intriguing.” This year’s A-level work has several similarities with Basquiat, demonstrating the potential breadth and depth of artistic practice by encompassing diverse activities such as personal reflection and political debate, she explained. QE’s actors combined adventure with comedy in their fast-moving re-telling of John Buchan’s much-loved tale of espionage and danger, The 39 Steps. 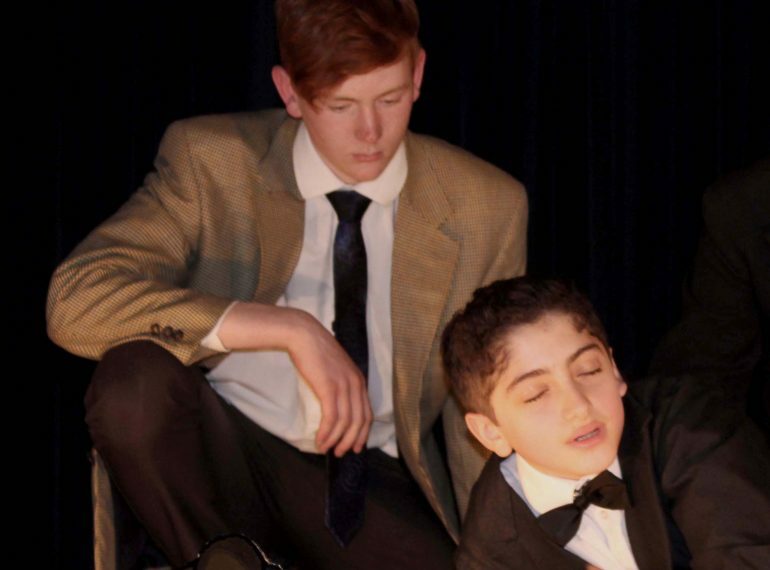 The 2018 School Play involved a cast of almost 40 boys drawn from Years 7–13, supported by boys in directing and technical roles and by a team of composers and instrumentalists led by Director of Music Cheryl Horne. The final night in the Main School Hall ended on an emotional note, as this was the last School Play for the production’s Director, Elaine White, who retires this summer. In addition to flowers, she received a tribute in the form of a book from QE actors past and present containing their memories of the many productions in which she has been involved. “The 39 Steps was a fitting swansong. The production was very entertaining – it has been many years since I have laughed so much! – and highly memorable, too. It was also well-attended over the two nights. And perhaps most importantly, the boys involved seemed to thoroughly enjoy performing. The 39 Steps was among the first spy thrillers ever written. Its author, who was born in Scotland in 1875, had a remarkable life which included: helping in the re-structuring of South Africa following the Boer War; working as a literary adviser for a London publishing house, and serving in the First World War firstly in the Intelligence Corps and later in the Ministry of Information, while also working as a war correspondent for The Times. After the war, he became assistant director of the British news agency, Reuters, and was the Unionist Member of Parliament for the Scottish universities, 1927–35. In 1935 he was created Baron Tweedsmuir of Elsfield and also appointed Governor-General of Canada – a post he held until his death in 1940 from a cerebral thrombosis. Buchan wrote throughout his adult life. Year 7 were treated to a matinee performance before the two public evening performances.